Boca Juniors coach Miguel Angel Russo has begun experimenting with different lineups in anticipation of the FIFA Club World Cup in December, trying to find a team that can take the trophy in Japan. His first move has been to move Ever Banega forward from his position in front of the back four, into the number ten playmaker position in place of Leandro Gracian. Boca have missed the influence of Juan Riquelme in this position and Gracian has never really stepped up to the plate, despite being the player that Russo originally wanted before Riquelme became available last year. 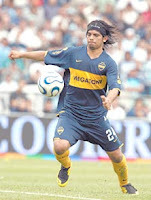 With no other recognised playmakers in his squad, Russo placed Banega in the position for Boca's away game against Racing Avellaneda at the weekend and the gamble paid off, with Banega performing admirably in Boca's 3-0 victory. He provided the assist for Rodrigo Palacio's goal and looked assured throughout. "I felt very comfortable. Luckily, the aid of Sebastian [Battaglia] and of the other players made taking control easier. I tried to play it simple. When I took hold of the ball, I tried to play forward and when we lost it, I returned to give a hand in the recovery". He does have previous experience of playing as the playmaker of a side, as he spent most of his youth career playing in the position, only moving back to the defensive midfielder role in the last couple of years. It will be interesting to see whether Russo keeps Banega in this position for the longterm and if so, what this means for the future of Leandro Gracian at Boca.